THE ONE, a project by Rotary District 3450, celebrated its seventh award gala dinner on May 16th. Two unsung heroes were crowned the year’s most outstanding humanitarians. 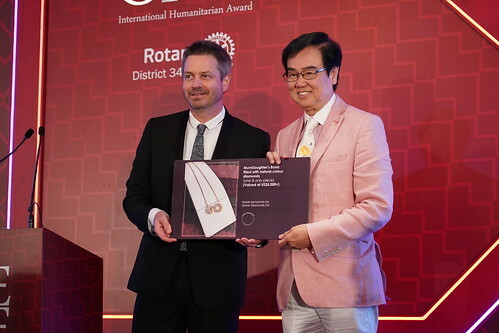 Nominated by President Stacy Ho of the Rotary Club of Hong Kong Island East, Jeff Rotmeyer won THE ONE Hong Kong 2018 and HK$200,000 to further his charities Impact HK which provides free services to the homeless community and Love 21 Foundation, which provides care for 40 autistic and down syndrome members. Enid Hendershot won the title of THE ONE International 2018 and the grand prize of US$100,000 to further Ramana’s Garden children’s home and school in Rishikesh India, where she provides shelter to orphans and free education to village children. 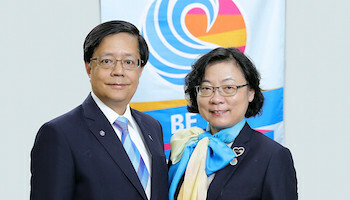 Both President Stacy and Enid’s endorsing Rotary club of Hong Kong Kowloon Golden Mile were awarded prize money to donate towards a charity of their choice. Other prominent attendees included guest of honour Hong Kong Chief Secretary for Administration Matthew Cheung Kin-chung, Hong Kong award ambassador Cecilia Wang, former Secretary for Food and Health Dr Ko Wing Man GBS JP and Deputy Director of the Hong Kong Basic Law Committee Elsie Leung Oi-see GBM JP. The evening brought in over HK$3 million in proceeds for future prize monies, including a US$100,000 donation to THE ONE Emergency Aid Fund, which helps past winners and runners-up in times of dire need. Every year, Rotarians from all over the world have been instrumental in gathering candidates for the annual awards. Earlier this year THE ONE was incorporated in the District Awards, allowing D3450 clubs to earn points by nominating a candidate. 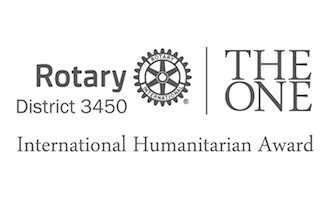 All Rotarians are invited to support THE ONE by contributing their services, joining the organising committee or attending the annual award gala dinner held in Hong Kong. Do you know an unsung hero? Nominate them for THE ONE Awards 2019 this summer! Applications will open on July 1st 2018. *To be donated to an HKSAR Government approved charitable organisation or a Rotary club in Hong Kong in the name of the nominator. Please see www.theoneintl.org for more information. To date, THE ONE has donated US$2.3 million to 42 awardees from 15 different countries, and over 300,000 lives have been saved or improved. Raised funds have contributed to four fully serviced care centres, three rehabilitation centres, two mobile care ambulances, three solar powered village clinics, a secondary school, a medical centre, maternity hospital, hospice for palliative care, cultural centre as well as food, water, medicine and care for tens of thousands. This entry was posted	on Sunday, August 5th, 2018 at 12:36 pm	and is filed under The One. You can follow any responses to this entry through the RSS 2.0 feed.Both comments and pings are currently closed.